What's Shaking on our tree? So every time I interact with a family member from Wilkes it seems as if they know "A" Henry Bolton from Wilkes or Oglethorpe county. Side Note: Wilkes and Oglethorpe county are counties in N.E. Georgia that are very close to each other. When I began my own research I noticed that none of the Henry Bolton(s) were the exact Henry Bolton I was thinking they were. Each and every time the Henry was a different one. So I am beginning a project that I hope will help with the confusion. There is a Henry Bolton born in Oglethorpe, Georgia born to Daniel and Rosa Bolton. He married Annie Stephens(on) and they had at least 3 children. Henry L. Bolton born in 1937 and died in Atlanta, Georgia in 2011. Henry L. Bolton born in 1938 in Statesboro, Georgia, deceased in 28 Nov 1998. April Birthdays & Anniversaries ! April 16th - Sharon Starks " Niecy"
Please note while all are not mentioned we do our best, and would be happy to have your family date to the list. Cousin Marcella Hughley saves her grandmothers' life! derived from MYFOXATLANTA STAFF/myfoxatlanta ATLANTA - A 10-year-old Atlanta girl is credited with saving her grandmother. Marcella Hughley dialed 911 when she realized her grandmother was semi-conscious. Crews arrived to take care of the grandmother. Marcella's grandmother's sugar levels were extremely low. Had it not been for the girl’s quick- thinking, her grandmother could have gone into a diabetic coma. Ceasar Booker lived to be 129 years old! Question of the Day: Who is Jerry Gresham of Rayle, Georgia? 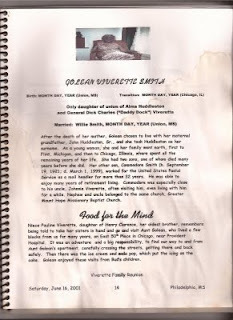 Related Relevations Mississippi - Illinois - Michigan Alma Huddleston Viverette was not the mother of Golean Viverette. Unfortunately the death doesn't state this but Queen Esther's sister did. She was apparently the daughter of Cardelle McCurdy who was either a Brown or Boler and then became a Williams.